The Stryker LD304 Birthing Bed provides comfort and security for both the mother and caregivers. This birthing bed is simple to operate, mobile and it’s designed to provide safety while bringing comfort to mothers in labor. 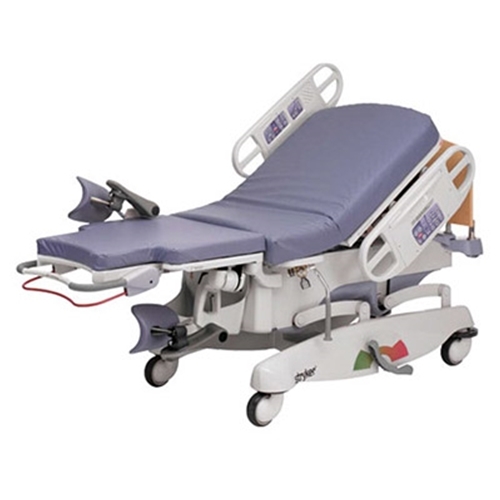 Convenient controls provide the Stryker birthing bed to get into trend positions with a single button, these options making it easy to customize the positions for minimum effort. The Stryker foot section promotes proper body mechanics to help prevent caregiver back strain or injury. 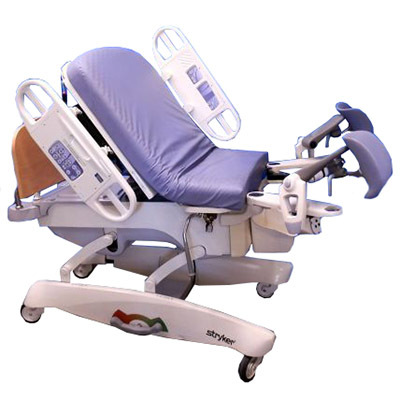 The Stryker Birthing Bed features the patented Skoocher, which moves the patient or mother closer to the perineal edge of the bed with the touch of a button. 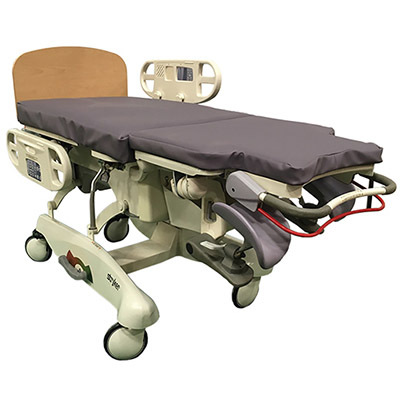 This is a very secure and comfortable bed for mothers and caregivers alike, and its simple operation, mobility, and ergonomic features are all you’re looking for in a birthing bed. Single-button Trend-like positioning and the Stryker powered Skoocher feature allow customized positions with minimal effort. The Stryker foot section promotes proper body mechanics to help prevent caregiver back strain and injury. Move mom closer to the perineal edge of the bed with the touch of a button. 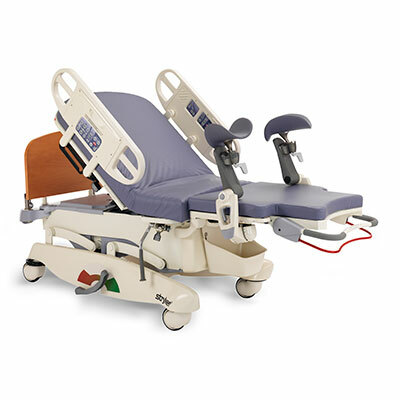 The LD304 birthing bed provides comfort and security for both the mother and caregiver. Simple operation, mobility and an ergonomic design provide safety with the ability to position the bed for mom’s comfort. To remove the head board, lift it straight up and off the bed. To replace the head board, align the plastic inserts on the bottom of the head board with the slots at the head end of the bed and lower the head board until it completely seats in the slots. The bed is equipped with a night light to illuminate the floor area around the bed. The night light will automatically activate when the light in the room becomes dim enough. o prevent a low battery condition when the bed is not plugged in, position the cord out switch at the head end of the bed to the off position. The switch is identified by the label shown below. If the switch is not positioned as shown below and the bed power cord and pendant cord are unplugged, the life of the backup battery will be significantly reduced. If the POWER LED (located on the outside of both side rails) is flashing, the 9V Nurse Call battery needs to be replaced. The battery is located at the head end of the bed. No tools are required to replace the battery. Unplug the bed power cord from the wall socket and replace the battery. After replacing the battery, verify the POWER LED is no longer flashing and operates normally when the different light settings are selected. Properly dispose of the old battery in accordance with local regulations. To position the labor grips, grasp the handle and pull the grip out and up above the mattress until the mechanism locks into position. To lower the grips, pull the lever to release the grip and, as it begins to rotate, release the lever and lower the grip to the stored position. To use the labor bar, insert it into the sockets located on each side of the litter at the pivot point for the foot pans. The labor bar can be used by the patient to aid with various birthing positions such as squatting or kneeling. The optional Stryker labor bar is rated to support 250 pounds. Before removing the foot section, put the footrests into position above the foot mattress and place the patient's feet in the contoured footrests. To remove the foot section, squeeze the red release handle at the foot end of the bed and raise the locking bar to the full−up position until it latches in place. The foot section will now slide straight off the bed. Soma Technology, Inc offers a wide range of Beds. If you have any questions about any of our Beds or need a quick quote, call 1-800-GET-SOMA and one of our knowledgeable sales representatives will help you.